We all see the mortgage interest rates on television, the Internet or in the news. But, most of these are just marketing rates – they’re used to give you a general idea and to get you interested. The bottom line is, every loan scenario is unique which means you might get a different interest rate than the person next to you. There are so many factors that are included to create an interest rate based on YOUR specific financial situation including your credit score, your down-payment amount, your loan amount and even the type of home you purchase. We break it all down for you right here. Rates vary depending on the market and several borrower-specific factors. This can get complicated. First, there are tons of different banks, credit unions and lenders that offer entirely different type of loans and corresponding interest rates. The rates you see advertised are usually meant for someone with excellent credit, applying for an owner-occupied single-family home loan, with a big down down-payment. Your scenario may be completely different, so it’s good to know about all the factors lenders are interested in when you apply for a loan. The two purposes for a loan are either a purchase money mortgage or a refinancing loan. A purchase money mortgage applies to the purchase of a principal residence, second home or investment property. A refinance is just obtaining new financing for an existing loan. You will probably get a lower rate for a purchase money mortgage than a refinance. Your rate will be different depending on the size of your mortgage. You will likely get a lower interest rate when your loan amount is under $417,000 and an even higher rate if your loan amount is over $625,000. When you hear things like jumbo loans and conforming loan limits, these are the loan amounts for the DC Area they are talking about and these different amounts affect your interest rate. This one is pretty simple: the higher your credit score, the lower your rate. This is the single most important factor to determining your mortgage rate. But, your score isn’t the only thing that matters; what it says on your credit report matters too! The loan-to-value ratio is the loan amount as a percentage of the total appraised value of the property. The higher the loan-to-value percentage, the higher your mortgage rate will be. If you’re purchasing a single-family residence, the mortgage fees will be slightly lower than if you were to purchase a condo. This is because a condo is part of a larger complex, so if other owners in the complex miss a payment or there are vacant condos, your condo will lose value. Interest rates will be even higher for a co-op. There are three types of occupancy: owner-occupied, second home or investment property. A second home will have slightly higher mortgage rates and an investment property may be even higher. This is simply because there’s less of a chance that a homeowner will walk away and miss payments on their own residence. This is how a bank determines how much home you can afford. It is your monthly liabilities divided by your monthly income. This gives them a percentage and the lower the percentage, the lower your mortgage rate. This is all about risk. Lenders base the interest rate they give you on how much risk they’re undertaking by loaning to you. That’s why we always give you as much information as possible about the process and how to prepare your finances. TIP: We recommend you shop around your mortgage rate! 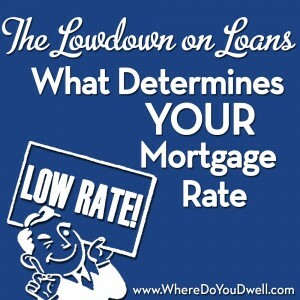 Again, different lenders will offer different loans and rates, so the more you know, the better your rate will be. All of this can feel overwhelming and complicated, but don’t worry – you’re not alone! No matter what your loan scenario is, our agents know all about mortgage rates and the lending process. We’re here to answer all your questions and lead you step-by-step to your best deal.